Hofstra University is located in HEMPSTEAD, NEW YORK. Hofstra’s campus is only 40 kilometers from New York City. John F. Kennedy and LaGuardia International Airports are approximately 30 minutes from Hofstra by car or airport limousine. The Long Island Rail Road provides regular commuter service from Pennsylvania Station in New York City to Hempstead Station, about five kilometers from campus. Type of School: Hofstra is a private, nonsectarian, coeducational institution. 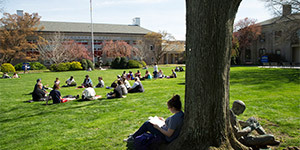 Size of Campus: Hofstra’s campus is 97 picturesque hectares. On-campus housing is available. Number of Faculty: There are 1,181 faculty members; 489 are full time (93% of full-time faculty hold the highest degree in their field). The University offers approximately 155 undergraduate program options and approximately 175 graduate program options as well as more than 100 dual-degree program options. Undergraduate degrees include BA, BBA, BE, BFA, BS, and BSEd; graduate degrees include ADVC, CERT, EdD, LLM, MA, MBA, MFA, MHA, MPH, MS, MSEd, PD, PhD, and PsyD; first professional degrees include AUD, JD, and MD; dual degrees include BA/JD, BA/MA, BA/MBA, BA/MD, BA/MS, BA/MSEd, BBA/MBA, BBA/MS, BBA/MSEd, BS/MBA, BS/MD, BS/MS, JD/MBA, JD/MPH, and MD/PhD. Geographic Diversity: Undergraduate students come from 45 states and territories and 66 countries. Financial Aid: International students are considered for academic merit-based scholarships only. Test Score Requirements: The Admission Committee requires all applicants whose native language is not English to submit scores from the Test of English as a Foreign Language (TOEFL) or International English Language Testing System (IELTS). For more information and testing locations, please visit toefl.org or ielts.org. Application Deadlines and Fees: August 1 for September admission; December 1 for January admission; application forms can be found online at hofstra.edu/apply. All documents submitted as part of a student’s application must be accompanied by English translations. Application fee: $75; checks or money orders must be drawn on US banks. At Hofstra University, you are encouraged to seek, shape, and discover your own educational and career path. Small class sizes emphasize both the creation and dissemination of knowledge, and Hofstra’s proximity to New York City offers a wide range of academic, cultural, and career opportunities. State-of-the-art campus facilities and strong community connections help students develop into confident and competent graduates. And with a student population representing 75 countries, Hofstra University is committed to providing the resources that all students need to become integral parts of the Hofstra community. As a Hofstra student, you will have endless opportunities for experiential learning on and off campus. 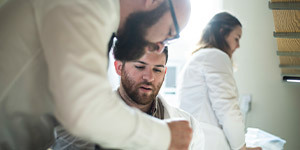 You can conduct research with a distinguished professor in our innovative labs—including a big data lab, a robotics and advanced manufacturing lab, and a cell and tissue engineering lab—or intern with top-tier companies in finance or media or in the state Legislature or Congress. You can also choose to work in our cutting-edge facilities such as the Martin B. Greenberg Trading Room, equipped with 34 Bloomberg terminals, or WRHU-88.7 FM, Radio Hofstra University, recipient of two prestigious Marconi Awards from the National Association of Broadcasters and one of the top college radio stations in the country (according to The Princeton Review’s Best Colleges, 2015–2017). Since its founding in 1935, Hofstra has evolved into an internationally renowned university that continues to achieve recognition as an institution of academic excellence. Hofstra has 25 academic accreditations and 28 total accreditations, and consistently earns recognition on the “Best Colleges” lists of U.S. News & World Report, The Princeton Review, Fiske Guide to Colleges, PayScale College ROI and Salary Reports, and Forbes magazine. Additionally, Hofstra has consistently been named to the President’s Higher Education Community Service Honor Roll and is the only university to host three consecutive US presidential debates (2008, 2012, and 2016). Hofstra offers over 155 undergraduate and over 175 graduate program options. More than 100 dual-degree program options are also offered, giving you the opportunity to earn both a graduate and undergraduate degree in less time than if each degree were pursued separately. All classes at Hofstra are taught by distinguished faculty members who are committed to excellence in teaching, scholarly research, and service. With an average undergraduate class size of 21 and a student-faculty ratio of 14:1, you are encouraged to debate, question, conduct research, discuss, and think critically in an open, collaborative learning environment. Hofstra ensures that international students are well-integrated into campus life by placing great emphasis on orientation, including programs that engage all students on and off campus. The Office of International Student Affairs helps international students reach their educational goals by providing assistance before their arrival and throughout their time at Hofstra, including academic, social, cultural, legal, and financial opportunities. Before classes begin, the office provides an intensive orientation program to introduce students to Hofstra and help them adjust to their new surroundings. The office also assists with immigration counseling and applications for optional practical training, curricular training, economic work necessity, program extensions, international student insurance, and visa renewals as well as travel assistance. We invite you to visit the campus and see for yourself what it’s like to be a part of Hofstra’s dynamic community. We recommend visits during our fall or spring semesters so you can experience our campus while classes are in session. Admission information sessions are offered twice daily Monday through Friday, with each followed by a guided tour of the campus. These sessions and tours begin at the Office of Admission in Bernon Hall, South Campus. To make plans to visit us, call +1-516-463-6700 or go to hofstra.edu/visit. If you are unable to see Hofstra in person, we encourage you to take our virtual campus tour at hofstra.edu/see. The Admission Committee requires all applicants whose native language is not English to submit scores from the Test of English as a Foreign Language (TOEFL) or International English Language Testing System (IELTS). For more information and to find a testing location, visit toefl.org or ielts.org. Hofstra seeks applicants with a minimum TOEFL score of 550 (paper based), 213 (computer based), or 80 (internet based). Applicants using IELTS must have a minimum score of 6.5; others with appropriate academic credentials are also encouraged to apply. Although the SAT and ACT are not required, students seeking merit-based scholarships are strongly encouraged to take these tests and submit the results to Hofstra.